Un Très Bon Tour – Run. Ride. Roam. Yes, today was indeed a very good ride. Très bon! The wind was still blowing, but not as hard as usual, so it was more of an annoyance than the real opponent that it has been. It was a chilly day and the wind was quite cold, so it was a “5 layer ride” for me (two thermals, a cycling vest and two jackets) and a “four layer ride” for Steve. 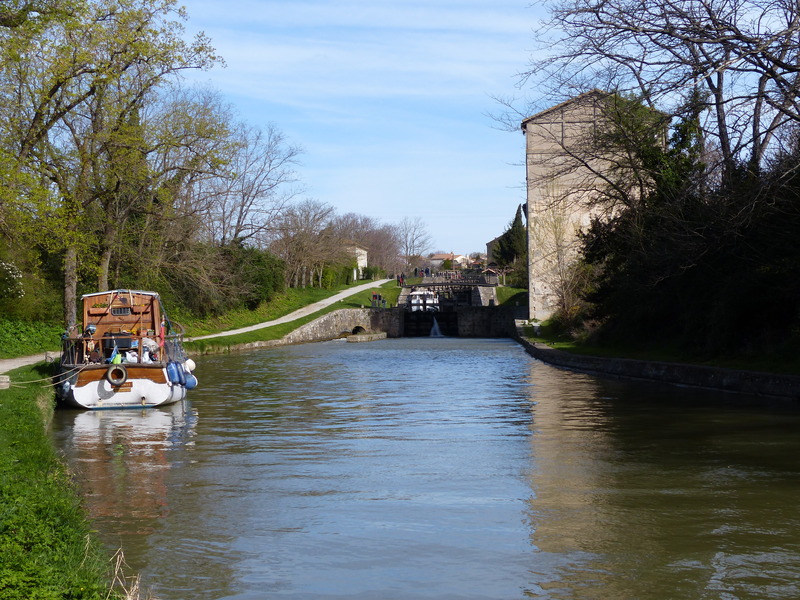 We left Capendu and headed to the canal to ride towards today’s pit-stop in Carcassonne. 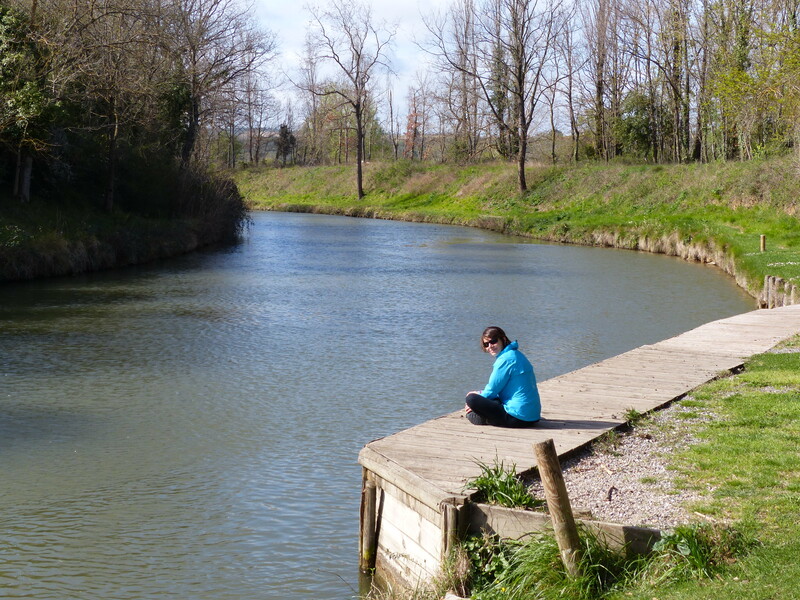 It was just lovely along the river, the path was perfect, the canal meandered around corners, with trees and fields either side, I kept taking deep breaths just to breathe in the smell of the trees and the countryside. It was delightful. The only other thing that would have made the picture complete was if Ratty or Mole had appeared along the bank, because the scene reminded me so much of Wind in the Willows. Looking for Ratty and Mole! 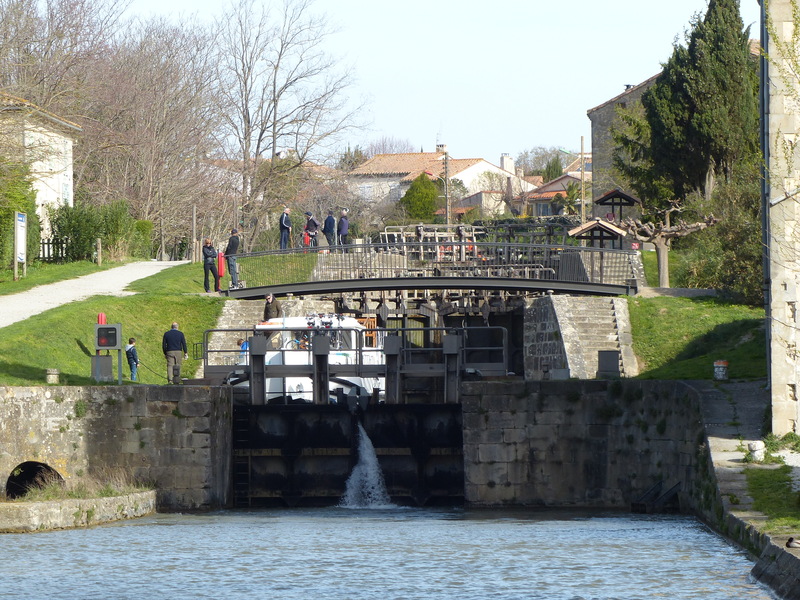 We passed walkers, runners and cyclists and waved to the people on the passing boats and exchanged “Bonjours” with all. We saw another canal bridge, the second one we’ve seen and it is pretty cool to see a bridge with water running over the top of it. 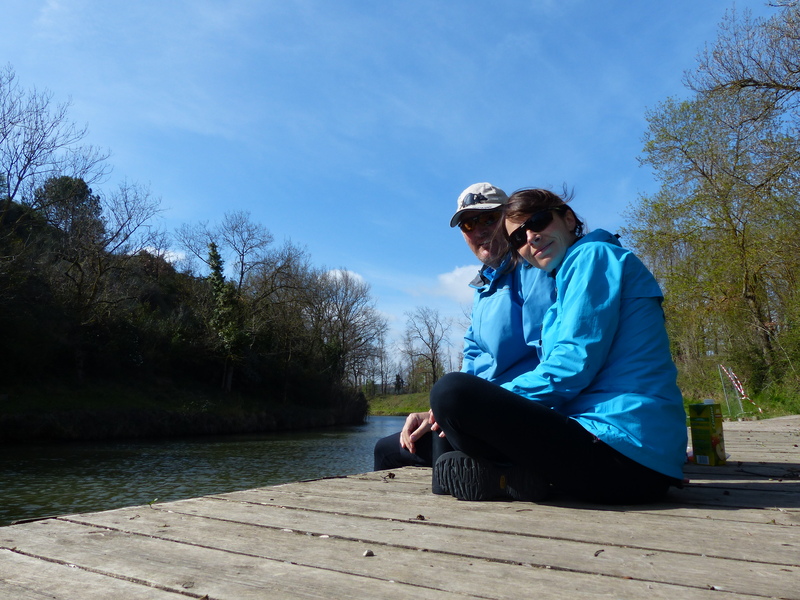 We stopped for elevenses beside a lock, sat on a small wooden jetty, had a snack and watched the lock open and a boat motor through. 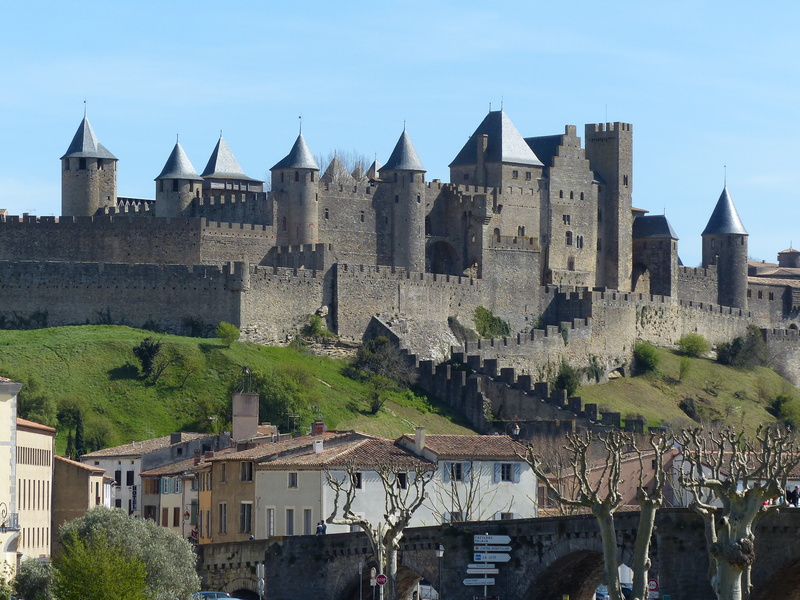 As we continued on and approached the outskirts of Carcassonne, we came across another confusing sign. This was right on the bike path and had those circles and pictures, but this time it had crosses through them. No cars, no motorbikes and what looked like no bicycles. “What!” exclaimed Steve in frustration and bewilderment. I mean, the sign was on the bike path, how could it be saying no bikes. We stared at it for a while, then we stared at it a little closer. When we looked at the picture that appeared to be a bicycle, we couldn’t see any pedals on the picture. Hmmmm, the brain went into overdrive, the visual literacy skills kicked in and we decided it must mean a motorised scooter, not a bicycle. At least that was what we were going to say to any official looking person who may have stopped us, because we rode past that confusing little sign and continued along the obviously meant for bicycles, canal path. We’re sure that’s what the picture meant, scooters or some such thing because the picture definitely didn’t have pedals. Anyway, no one stopped us or shouted anything to us or gave us dirty looks, so I reckon we were right. Nevertheless, we have had a right ol’ time of it trying to read signs. You’d think reading pictures would be easy, but nooooo! Well, at least not easy for these two foreign tourists who obviously need to go back to Kindergarten for a crash course in picture reading! 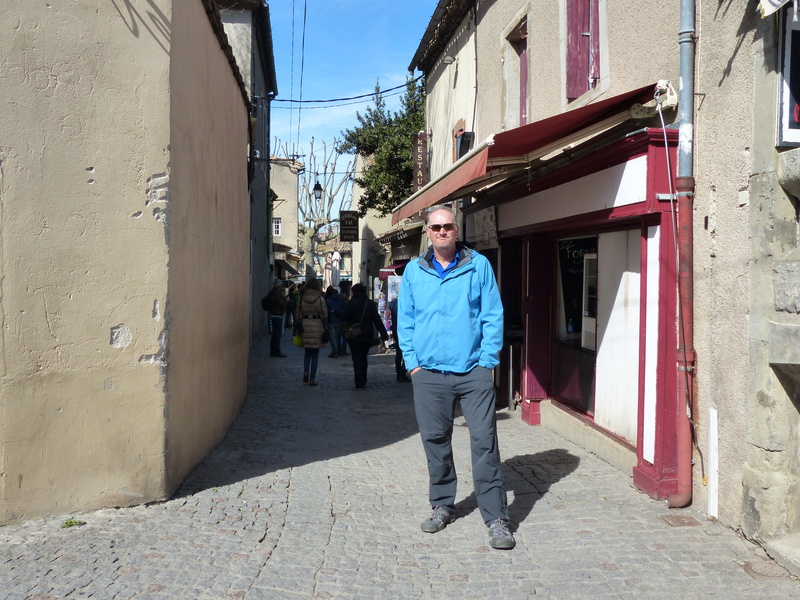 We rode into the city of Carcassonne and the bike path went straight up to a pedestrian crossing, so we waited to cross the busy road and continue on to our cheap and cheerful hotel. We waited…and waited…waited…waited…the traffic zipped past in both directions…still waiting…traffic still zipping past in front of us…waiting…not a single car stopped! Not one! We took note – cars do not stop at pedestrian crossings! Those black and white lines on the road may as well be paisley swirls because they mean not a thing, so we will remember that from here on and never assume that an approaching car will slow down, let alone stop, because they just don’t! Mind you, we were the only ones at the pedestrian crossing, so maybe it was just the sight of us, in our fashionable layers of cycling chic, that caused the drivers to create a rapidly moving and continuous barrier to our entry into the city. Maybe the motorists took one look at us in our socks and sandals and instantly thought, “Très désagréable! Our beautiful city does not want riff-raff such as this! Begone! We are repulsed by such crimes against fashion and all things civilised! We shall not permit entry to such offensive tragic travellers!” So then, like one intelligent organism, the traffic acted as one and created a zipping, zooming barricade, preventing us crossing into the city. Maybe that was the problem? Anyway, the traffic eventually backed up and we nipped across, dodging bumpers and just like that, we had penetrated the defenses and were in! We found our hotel, checked in, squeezed the bikes and all their gear one at a time, into the very teeny tiny elevator and wheeled ourselves up to our room. A quick shower and snack later and we headed back out on the bikes to have a look around the historic fortress and castle. This looked like a fairytale castle and was amazing to walk around. 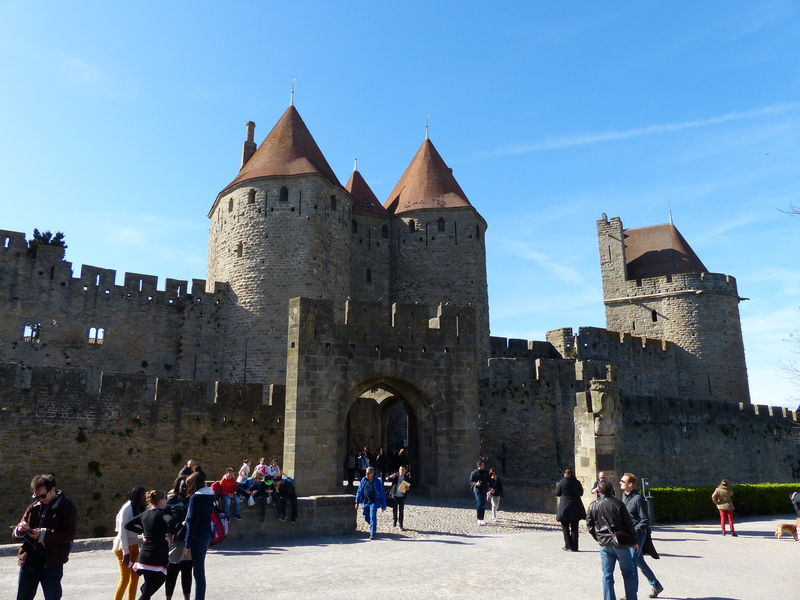 It’s a fortified town, not just a single castle, with cobbled streets and narrow passageways. 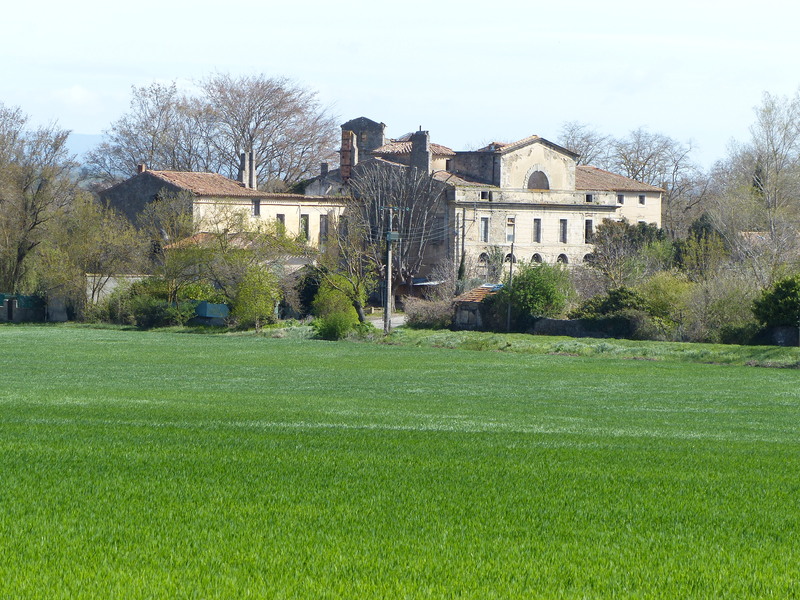 It dates back to the 6th century and was fortified by the Romans and then various battles over the centuries saw different armies take control and new fortifications were added. It looks spectacular and is beautiful to walk through (if you ignore all the tourist shops). 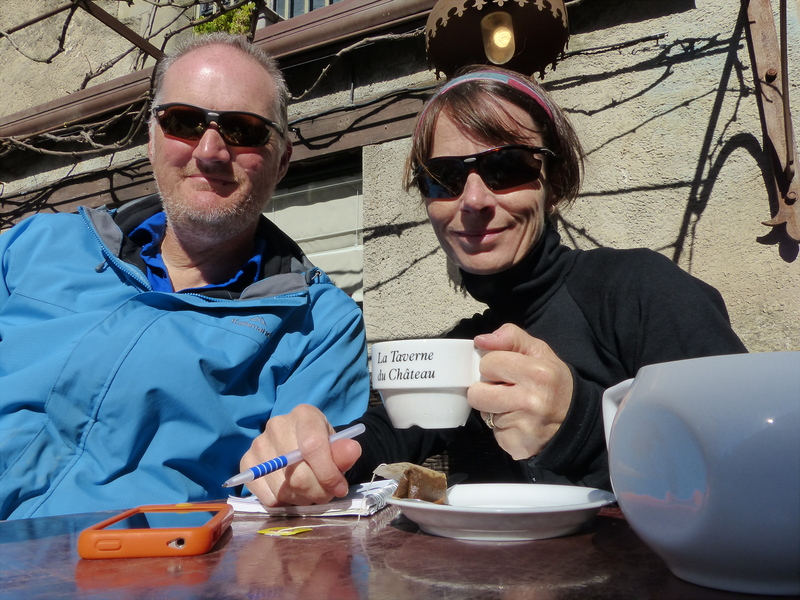 We spent a leisurely time wheeling the bikes around and walking through the cobbled streets and then sitting and having a drink in the sun. I also have another nice memory of the day. 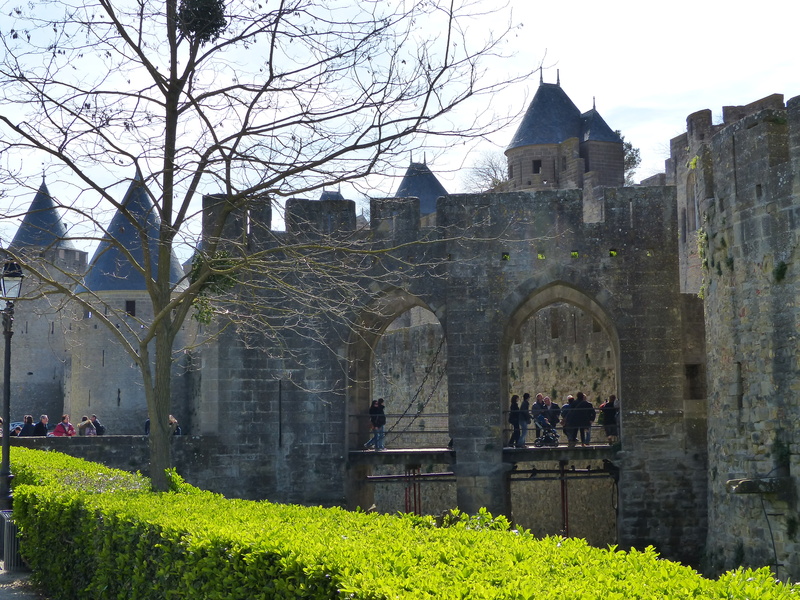 As we rode across the bridge towards the castle, an elderly lady was walking towards us. She was small and round and stooped, with multiple cardigans, a head scarf and a slow and careful walk. As she approached me I smiled and said, “Bonjour” and she gave me the most beautiful toothless grin. Not a pearly white lay behind those lips, but she was beautiful and the smile was dazzling. 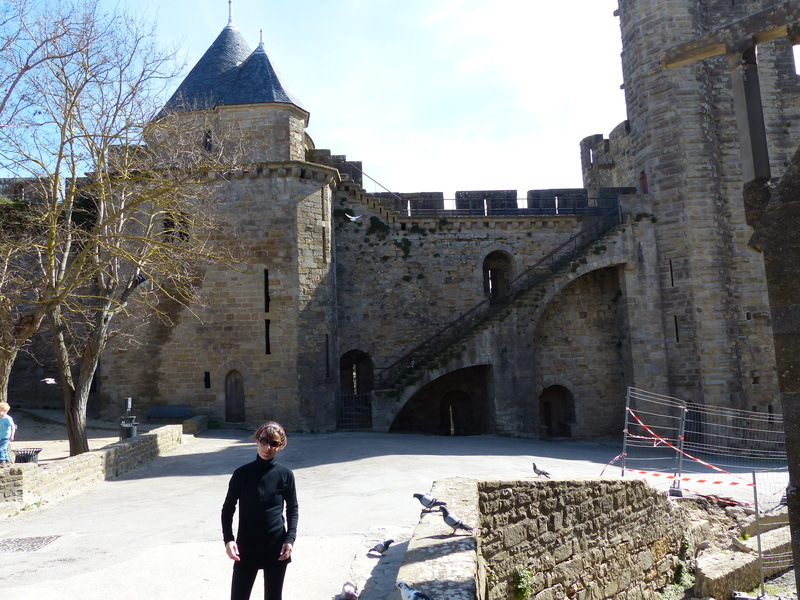 I am loving the sense of history I feel here, we see mediaeval history, such as in a place like the fortified castle and we see signs of war history and even just everyday scenes in the countryside, create mental images of decades past. There was a scene today along the cycle path where I looked over the fields to a large stone building and instantly thought of this region being occupied during WWII and could picture a group of soldiers walking across that field, with the building in the distance, hoping for refuge and rest within its walls. Everywhere just has a real sense of story. I love that. I’ll tell you something else I love…such a small thing…I love seeing people walk around with their baguettes under their arm! No it is not a cliche, it is real life here in France. People walk along carrying their baguettes, or have them poking out of their bicycle baskets. It looks such a picture. 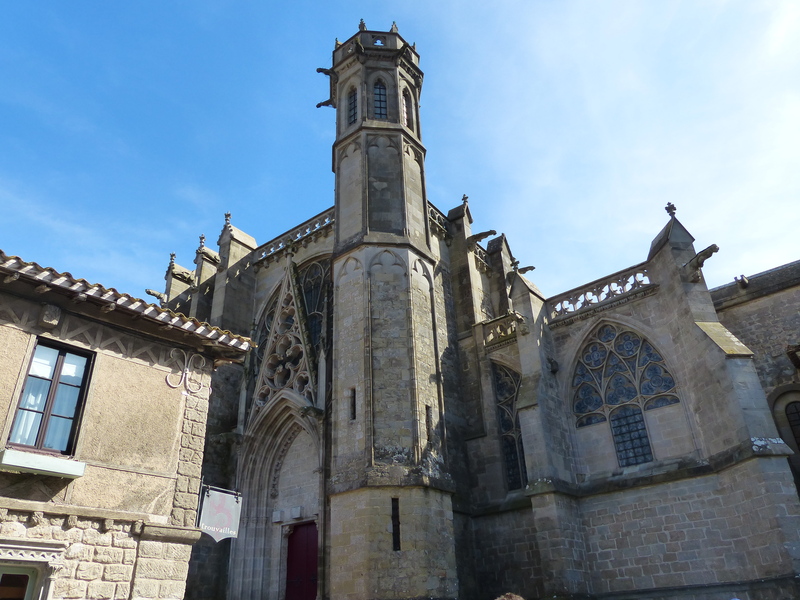 A few days ago as we were leaving Narbonne, we had stopped for a quick snack and were sitting on a bench beside the canal and a group of three girls, who looked about 15 years old, walked past us and sat on another bench. They had obviously just been to the bakery, because two had bags of pastries and one was carrying a long baguette. They sat down to have their snack and the girl with the baguette began tearing pieces off it and chewing happily on her bread. I loved seeing that. If that scene were replayed at home, those girls would have sat down and inhaled a couple of Big Macs, or something like that, so to see a teen carrying her baguette under her arm and chewing away on her torn pieces of bread, while the three friends chatted, it was a lovely scene. So today was a really nice ride, with a slight drop in the wind and with delightful scenery. 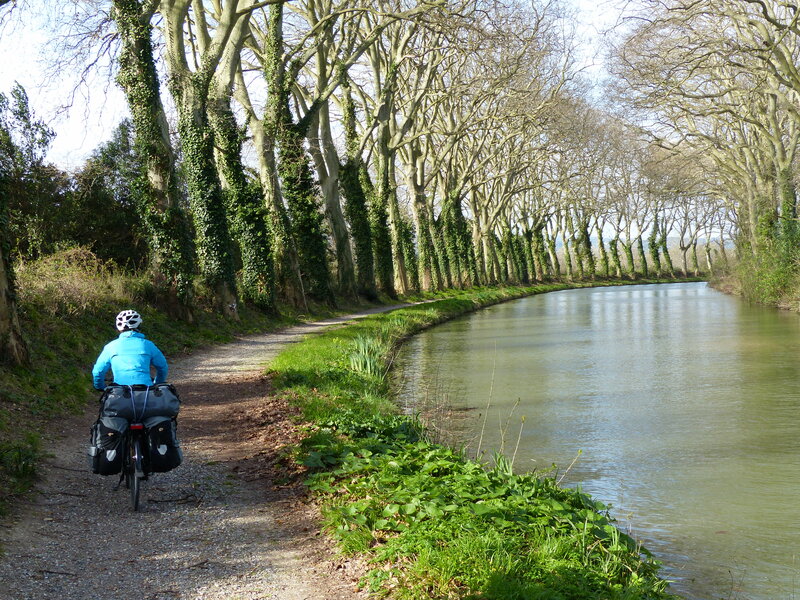 I am absolutely loving the canal paths, not just for the nice flat riding they give us, but for the idyllic picture they create. It’s a real highlight and has been a really special place to ride. From my point of view, it was a nice ride and a lovely stroll around the historic walled town. I’m just sorry if we offended any of the locals with our questionable fashion and tragic traveller appearance! Sorry France, the victims of feral fashion have arrived and we’re approaching a town near you! A Very Good, Good Friday!